Many of Quang Ninh’s important investment, trade and tourism partners are located in the Northeast Asian region. Out of the 120 valid foreign-invested projects in the province, 79 are run by firms from Northeast Asia with total investment capital of US$2.1 billion. China has 66 projects capitalised at US$1.7 billion in Quang Ninh, mostly involving tourism-hospitality, service, industry, mining, construction materials and fiber production. Japanese investors have poured more than US$380 million in 7 projects in Quang Ninh, focusing on industry-construction and agriculture. Investors from the Republic of Korea have 6 projects with US$33 million operating in agriculture, trade and service. Since 2012, nearly half of 127 investor delegations visiting Quang Ninh to look for investment opportunities are from the Northeast Asian region. In the field of tourism, Quang Ninh set up ties with several Chinese localities such as Guangxi, Fujian, Yunnan and Hainan in as early as 1995. The province became a member of the East Asia Inter-Regional Tourism Forum (EATOF) in 2006, which gave a boost to linkages in tours, tourism promotion, product development, brand building and experience sharing between Quang Ninh and 12 provinces in East Asian countries which are members of the forum. Total trade turnover between Quang Ninh and the three Northeast Asian countries of China, Japan and the Republic of Korea surpassed US$1 billion in the first half of 2018, with Quang Ninh’s exports valued at US$537 million. Pham Ngoc Thuy, Director of the province’s Tourism Department said the Northeast Asian region is the most important market for Quang Ninh’s tourism, accounting for two thirds of the number of foreign visitors to the province. Arrivals from this region during 2013-2017 increased by 48% compared to the previous five–year period. Despite such figures, economic experts are of the opinion that Quang Ninh has not fully optimised available opportunities. They pointed out that investment into the province mainly concentrated in tourism, service and industry, with only a small fraction going into agriculture and forestry even though those two sectors have great potential and offer many incentives for investors. Agriculture and forestry have so far attracted only 6 out of 79 projects of Northeast Asian investors with US$61.7 million, which caused an imbalance in the economic structure. While Japan and the RoK are the two leading investors in Vietnam, Quang Ninh has so far failed to catch the attention of companies from those two Northeast Asian economic powers. In the first six months of this year, Japanese investment in Quang Ninh stood at only US$43.4 million, and that from the RoK US$31.4 million. In addition, a majority of projects by Northeast Asian investors in the province are of medium and small scale. Among the 79 investment projects by investors from the region, only 10.1% have registered capital exceeding US$50 million. Deputy Director of Quang Ninh’s External Affairs Department Vu Dinh Xung said the province will work to intensify its partnership with localities in the Northeast Asian region in trade, investment and tourism promotion. The province has reviewed its investment promotion in order to find shortcomings and seek suitable solutions. 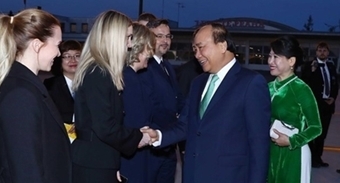 Xung added that a series of major transport projects have been or will be put into operation soon, such as the Hai Phong-Ha Long-Van Don highway, the Van Don international airport and the Hon Gai international port, greatly improving Quang Ninh’s connection with the world. He said Quang Ninh will optimise its advantages to create a breakthrough in wooing partners over the world in general and in the Northeast Asian region in particular. The WEF ASEAN 2018 will receive more than 1,000 delegates, including high-ranking government representatives and executives of regional and world-leading corporations. It is scheduled to take place in Hanoi from September 11 to 13 under the theme of “ASEAN 4.0: Entrepreneurship in the Fourth Industrial Revolution”. The forum will feature an open forum on ASEAN 4.0 for people’s benefits, an opening ceremony of the plenary session on September 12, and 60 in-depth sessions and discussions.